The Municipal Stormwater Regulation Program was developed in response to the U. S. Environmental Protection Agency’s (USEPA) Phase II rules published in December 1999. 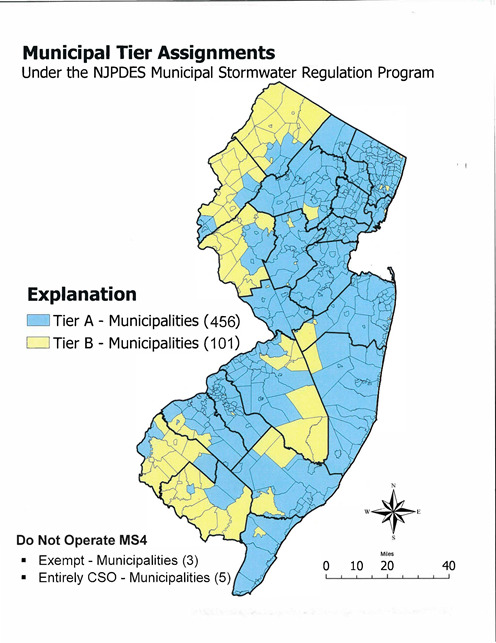 The Department issued final stormwater rules on February 2, 2004 and four (4) NJPDES general permits authorizing stormwater discharges from Tier A and Tier B municipalities, as well as public complexes, and highway agencies that discharge stormwater from municipal separate storm sewers (MS4s). Public complexes include certain large public colleges, prisons, hospital complexes and military bases. Highway Agencies include county, state, interstate, or federal government agencies that operate highways and other thoroughfares. The general permits address stormwater quality issues related to new development, redevelopment and existing development by requiring regulated entities to implement Statewide Basic Requirements (SBRs). The Department has issued the final renewal permits for the Tier A, Tier B, and Public Complex Municipal General Permits. The Highway Agency General Permit is currently expired. However, this permit will remain in full force and effect until the renewal permit is issued. Until then, continued implementation of all aspects of your Highway Agency General Permit is required. You will be notified once a draft permit is available and have the opportunity to comment on any proposed changes at that time. If you have any specific questions on the renewal process or the recent renewal of the Tier A, Tier B, or Public Complex MS4 General Permit(s), please contact your case manager or you may email, stormwatermanager@dep.nj.gov. The Department appreciates your continued cooperation in this matter. *NEW - The Department’s mapping and inventory assistance tools are now available. Please visit the following webpage for more information. Each MS4 General Permit and related documents including specifications for MSRP Annual Report and Certification can be found under the specific permit category below.